One of the fondest memories of when my son was a tiny, little baby, was when I sat in my glider in his nursery, rocking him to sleep. It became part of our nightly routine and was ultimately a bonding experience between the both of us. The right nursery glider will make your evening feedings more bearable, your little one's nursery more inviting, and the times spent consoling your sick baby more comfortable. If you’re on the fence about getting a glider, get off of it and get one! If you’re on a tight budget, there are plenty of chairs that will do, or simply add one to your registry. Read on to learn everything you need to know about choosing the best glider for you! Do You Need a Glider? So technically, a glider doesn’t fall into the “need” category. However, it is very useful and a glider does serve an important purpose. A glider helps you nurse or bottle feed your baby comfortably, and it allows you to simultaneously rock them to sleep. Babies crave calmness, and a gentle and steady sway helps them feel at ease. A glider is also an essential item for comforting a sick baby, or little ones who suffer from acid reflux and need to be propped up for a bit after a feeding since they can’t initially be placed on their back. Gliders also encourage story telling, since it’s the perfect seat to snuggle up on and share a good book. My son and I had lots of favorite stories we read together over the years. So a glider definitely has its place, it's just up to you to decide whether you need one or not. Protects your floor. A glider won’t mark up hardwood or tile the way a traditional rocking chair does because it sits on a stable stable base. Smooth rocking. A glider delivers consistent, smooth, rocking results each and every time. Adds warmth to nursery decor. Because gliders come in all different kinds of fabrics, colors, prints, and patterns, you can be sure it will add an element of warmth to your nursery, and then eventually your home. Durability. Gliders are built well, are sturdy, and they last for years. Truly an investment piece, you’ll get at minimum a decade’s worth of use out of it. Easy to Clean. Choose a carrier that is easy to spot clean, wipe down, or just wash in general. It’s always helpful and convenient to be able to toss it in the washer. Sometimes, fabrics and materials used in wraps tend to stain, so be aware of that before hand. And, as mentioned above, a glider helps your baby get comfortable before bed, serves as a bonding item, provides support to caregivers and babies during feeding time, and it makes a great reading or play chair! Be sure you have enough space before buying or registering for a glider. Know where you want to keep it and measure how large the chair is, and how far it extends when rocking. Many gliders also have either an accompanying ottoman, or a leg lift, so take those measurements into account as well, to determine if space will be an issue, or if you need to purchase a very small and compact glider (because they do come in different sizes). You definitely want a glider that is sturdy. Not only does this ensure that the chair won’t flip over, it will eliminate squeaks and other creaky sounds that could majorly disrupt your baby from eating or falling asleep. Do You Want an Ottoman? If you don’t really want to put your feet up when rocking your baby, then you probably don’t need an ottoman. This accessory just adds more onto the price tag and takes up room. I personally had plenty of space in my nursery and liked the thought of kicking my feet up and relaxing. But, many of my friends felt quite the opposite, and wanted a glider that came without one. When you get your glider or when you test one out in the store, be sure that the chair supports your frame. This sounds somewhat silly, but is actually serious. In order to be safe, your feel have to fully touch the ground, and you should have plenty of room in the chair (not feel squished like a sardine). Gliders come in all different forms for all different bodies, so check out the dimensions before making a purchase. Do you want your glider to swivel as well? Some chairs will turn all the way around, while others will rotate from side to side. Keep this in the back of your mind when making your decision to ensure all your preferences are addressed! Ease of cleaning. I can’t tell you how many times my son spit up on me and my glider during late night feedings. He’s been sick on that chair, and there’s been plenty of drool, boogers, and spilled juice on it as well. Thank goodness I selected a chair that was easy to clean, and that hid stains and spills well. Opt for something that has a texture and/or pattern, and that is also easy to wipe down. Some chairs allow you to unzip the cushion cover and literally toss it in the washer. Others, fare well with a heavy spot cleaning. Pocketed. There’s lots of gliders on the market that boast built in pockets on the side of the chair. This helps hold burp cloths, baby wipes, tissues—you name it. It was a feature that allowed for convenience, especially in the middle of the night, when I really felt like I was using it the most! Reclining feature. In addition to kicking your feet up, a great glider allows you to lean back. There will be times when your little one is very sick, or they suffer from feeding issues (like reflux), and they need to be propped or positioned a certain way. I’ve fallen asleep on my glider many times with my son, and it also allowed me to sleep comfortably bedside when he was suffering from the tummy bug in his toddler years, or when I wanted to keep an eye on a fever when he was a baby. Padding. I can’t imagine sitting on a hard, rigid, old-fashioned rocking chair! My glider had padding galore (and springs for support). Look for a chair that boasts plenty of arm padding. Your arms tend to get sore from feeding and holding your baby—especially when they get older and larger. I also loved how my back felt like a million bucks, even after sleeping on the reclining glider after a night or two. Locking feature. A locking feature allows you to get out of your glider without waking your baby up. After all, isn’t that the point of using the glider to begin with? When you lock the glider, you will also ensure safety to your toddling baby’s fingers and toes once they start to get curious and want to know how things work, and what’s underneath the chair. Lumbar support. When your baby is a newborn, you’ll be sitting with them quite often. A great glider takes lumbar support into mind. Its design allows for perfect proportion and helps relieve pain or stress off the back, hips, shoulders, and neck. This is especially helpful once your baby starts to grow and become larger in height and weight. At first, when I was learning about gliders, I thought that they were exactly the same as nursery rocker. Nursery gliders slide back and forth, in a smooth horizontal motion. A rocker only sways back and forth, and it’s movement is more severe and can be choppy or inconsistent depending on how hard you push. A glider is gentler, and can also swivel, as I mentioned above. A rocker won't allow for this. Gliders also tend to have springs built into its cushions for optimal comfort, and generally have an ottoman built in or that accompanies it. Gliders also have more cushion and padded arms, or even a skirted bottom to cover up its base. Rockers tend to not have these features. A glider also stands on two legs with a moving base, making it much more stable and secure than a rocking chair. However, both can pinch little one’s fingers if a child is left unattended around either. Never allow your baby or toddler to play underneath or around the chairs. When picking a glider, you can choose between one with a high back or a low back. Basically, a glider with a high back allows you to lay back and rest your head on something. A low back style generally only offers back and core support. Low backs are more modern in design and compact in size. High backs boast a traditional design and are much larger in size. I opted for a high back style, luckily, because I had to recline and lean and rest my head on something when I had to position my son after his feedings before placing him in his crib. I also knew my caretakers preferred to have something to fully rest their head on, since it would be more comfortable for their aging bodies. I just figured that the more support, the better for everyone involved! The Mikayla Swivel Gliding Recliner by Baby Relax (click here to check the price on Amazon) is both good looking and functional. The color combination looks nice, and the contrasting white details are stunning. Attention to detail is easy to see based on the piping and button tufts on this well-designed glider. Parents searching for a glider with all the bells and whistles, this could be just what you are looking for. It reclines. Easily prop your legs up with an easy-pull mechanism to any number of various degrees. Find the most comfortable position for you while feeding, napping, or reading to your little one. Both swivel and gliding motion. Equipped with a ball bearing mechanism to give you a full range of movement. Keep an eye on your toddler while feeding your newborn. Loads of support. Spring core foam filled seat gives your ample back, leg, and bottom support. This glider is big enough for your older child to fit as well. Easy to assemble. Although this swivel gliding recliner comes in several parts, it is fairly easy to put together. With the help of a partner, it should take no time at all. Plus when you are done, you can take a nice nap and reap your rewards. Leg rest is hard to get down. While the leg rest has an ‘easy-pull’ function to go into position, it can be pretty difficult to get down. If you are a c-section mother, you might want to wait until you are completely healed to use this chair. It’s big. At 41.75’’x 30’’ x 37’’ it can take up a lot of space. Additionally, if you are smaller in stature, your feet may not touch the ground when sitting fully against the backrest. Squeaky noise. Occasionally when rocking a faint squeaky noise can be heard. This could be more of an issue for the parent than your baby. Babies tend to be heavy sleepers. 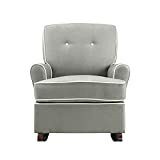 Another great rocker chair by Baby Relax that was designed with your comfort in mind is The Mackenzie (click here to check the price on Amazon). Available in many shades to match just about any nursery theme. If you are looking for a true rocker instead of a glider, this may just be the cozy option you are looking for. Easy to clean. The Baby-Soft Microfiber material is easy to clean. Just dab with a wet rag for a quick spot clean. Unexpected, or rather expected messes are sure to pop up often. Having an easy to clean nursery chair is essential. Lumbar support. The thick padded back of this nursery rocker provides you with the support you need, even in the longest of sittings. There isn’t anything worse than having a back cramp and a perfectly sleeping baby you don’t want to disturb. High-quality materials. Made with microfiber and solid cherry finished wood legs gives you a sturdy rocker you can feel safe in using. This rocker was built to last so you can be worry free. Arrives unassembled. While many rockers and gliders come not yet assembled, this one is a bit more unwieldy. It is very hefty and requires two people to lift and put together. Do not try attempt to lift this rocker alone if you are currently pregnant. Lacking head support. The back of this nursery rocker is not especially high. If you plan to use this rocker for napping, it may be uncomfortable. However, if you plan to use this rocker more for feeding and reading to your little one, you should be okay. The Windsor Glider and Ottoman set by Angel Line (click here to check the price on Amazon) is super cute and cozy. It adds a final touch of charm to any nursery, and it doesn’t take up too much space in your nursery, yet is still a completely functional option. Choose the Windsor Glider and Ottoman set if you are low on space but still want a cozy place to relax during feeding time. Storage. The padded arms of this chair have storage pockets which are great for bottles, bibs, books and anything else you may need as your baby grows. Removable cushions. The cushions on this chair are easy to remove. Removable cushions are easier to spot clean any sudden messes. They are also perfect for when your little one wants to make a pillow fort. Easy to assemble. The instructions provided are pretty run of the mill, and an Allen key is all you need. An Allen key is provided for a speedy build. Off-putting chemical smell. Upon first assembling this chair you may notice a faint chemical smell. If you are sensitive to these types of smells, simply let the chair breathe a few days before use. Springs can come loose. After several months of use, springs begin to come loose and need re-adjusting. They are easy to pop back on, but it can be an irritating problem when all you want to do is relax with your little one. The lovely Hoop Glider and Ottoman Set by Stork Craft (click here to check the price on Amazon) is a mid-range glider that does the intended job. This set is ideal for mothers that want to make feeding time easier while maintaining a charming look to the room. If you are looking to buy a nursery glider and ottoman set that will hold up well after the baby is into their toddler years, this set may be what you have been searching for. Storage. Keep your belongings close at hand with the large side storage pockets provided. Store all your ‘mom stuff’ on one side and all your ‘baby stuff’ on the other for quick access to anything you could need with one reach. One year warranty. This JPMA Certified glider has a limited one year warranty for anything that could potentially go wrong with it. This security is nice to know when it comes to any baby related products. Easy assembly. This glider comes in several parts that are very easy to put together. Total assembly time should be around 30 minutes. Neutral color combinations. This chair comes in a variety of different color combinations that are easy to pair with just about any nursery for a completed look. Padding isn’t the most cozy. The padding on this chair is a bit thin and needs a good fluffing often. Luckily the cushions are somewhat easy to fluff or else, additional pillows would be necessary for this chair to be comfortable. Hand wash only. The cushions provided with this chair are hand wash only, which leaves you only the ability to spot clean. After years of use, this could leave your chair looking shabby. Stork Craft has another set that's also popular among moms, the Tuscany Custom Glider and Ottoman (click here to check the price on Amazon). This glider set and ottoman set is available in 6 wood colors and 4 fabric choices, giving you a custom match to your nursery. It could be great for your family if you're looking for something that will last throughout your child’s early years, or if you are a family with multiple young children. Super smooth glide. Metal enclosed ball bearings give you and your baby a gentle motion. Whether you want to lull your baby to sleep or relax comfortably while feeding your little one, this glider offers a smooth option. Lots of seating room. This large seat is big enough for either parent to fit comfortably. It also has plenty of room for a young toddler, making it great for a cozy reading time. Lumbar pillow. Chances are, you'll be using one of these pillows whether it comes with your chair or not. However, since it’s included with your purchase, it's one less thing to worry about buying. Use this pillow for additional back support or to support your little one while they are feeding. Not heirloom quality. This chair isn't exactly built to last long and you probably won’t be passing this down to your child once they decide to have children of their own. However, if you are looking for a glider that will give you support for a few solid years, this one may work for you. Needs a wide birth. Before purchasing this glider, think about how much room you have in your space. It can tend to hit the wall if it’s placed too closely. DaVinci has been coming out with some stylish baby gear lately, and their modern looking Swivel Glider (click here to check the price on Amazon) is a testament to how fashion and functionality can go hand in hand. A good set for new parents to rest their feet during feeding time, it also transitions nicely to when your child is older. If you're searching for the perfect glider and ottoman set that will look great in any room, not just the nursery, this may be your best bet. No assembly required. Simply take this glider and ottoman set out of its box, and you are ready to go. Place it in any room in your house for a stylish nursing chair. Lower back support. A high back and bonus lumbar support pillow keep you comfortable even for the longest durations. Enjoy holding your baby throughout feeding and lull them to sleep without worry of back pain. 360 degree swivel motion. Keep an eye on your toddler no matter where they are in the room without getting up and disturbing your little one. Ottoman doesn’t glide. While this isn’t a huge issue, it would be a bonus. Most ottomans move in sync with the glider. Perhaps down the line, DaVinci will create a set that has this feature. Sharp angles. The chair has a very sharp recline which can feel awkward occasionally. Snoozing on the chair is cozy, but reading or breastfeeding can feel a tad uncomfortable until you manage to get your position exactly right. The Naomi Home Brisbane Glider (click here to check the price on Amazon) allows you to add the perfect mixture of comfort and style to any room with this glider and ottoman combination. A basic set that will last as long as you need it. If you have been looking for a glider and ottoman set that will fit most of your needs, you may want to consider this set. Easy to clean. Cushions are removable and machine washable. Made from 100% polyester so you can spot clean them when necessary. You never know when you will get spit-up, spilled juice or other messes on your glider. Lightweight. Easy to move from one room to another if you choose, giving you a versatile chair that can be used just about anywhere. Quick assembly time. With the wrench and easy to understand instructions provided, this chair can be assembled in a mere 15 minutes. One person is certainly able to put this piece together quickly without problem. Limited weight capacity. This glider has a weight capacity of 250 lbs. Other gliders can support much more weight. Larger adults may want to avoid this glider to prevent a dangerous scenario. Poor positioning of arm rests. The padding of the armrests tends to slouch and need quite a bit of readjusting to be comfortable. Although this can be annoying, you can resolve this by using a pillow while feeding. Initially, I never considered a glider a priority for my nursery. But, after using one for years, I’m not sure how I ever could have survived without one. Besides providing me with many years of memories, that glider helped keep myself and my baby comfortable and safe with every feeding, cuddle, and story. Be sure to consider the outlined points above before shopping for one, and the features that separate a good glider from a great one!